New data from the largest nationally representative study on adverse childhood experiences (ACEs) made headlines this week on National Public Radio (NPR) in the article Childhood Trauma and its Lifelong Health Effects More Prevalent Among Minorities. The research, headed by Melissa T. Merrick of the Centers for Disease Control and Prevention, finds that nearly 62% of respondents reported at least one ACE, and 25% reported 3 or more ACEs. These ACEs are not evenly distributed among identities, and the study researchers found that multiracial and gay, lesbian, and bisexual individuals had the highest rate of ACEs, followed by those identifying as black or Latinx, those with less than a high school education, and those with an annual income below $15,000. Adverse childhood experiences, or ACEs, are traumatic childhood experiences such as abuse, neglect, or exposure to other traumatic events. 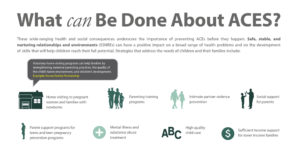 The Centers for Disease Control and Prevention (CDC) highlights specific events as examples of ACEs, such as physical, verbal, or sexual abuse and family dysfunction, including family separation, family incarceration, domestic violence, substance abuse within the family, and having a family member with a mental illness. This new study helps us to look at ACEs as a public health problem. We were already aware of the long-term health impacts of ACEs, such as increased risk of heart disease, cancer, diabetes, stroke, and other chronic diseases. Because this study is nationally representative, we can see the scope of problem that ACEs play in many of these health issues. There is also an opportunity for secondary prevention, preventing further harm and trauma after someone has experienced an ACE. Teaching coping skills, building resilience, and finding community are examples of how we can prevent additional trauma and promote healing for those who have experienced ACEs. Finding community is especially important for avoiding social isolation, which researchers identify as a possible explanation for bisexual and multiracial people experiencing the highest risk of ACEs. For more information on the new ACEs study, read Childhood Trauma and Its Lifelong Health Effects More Prevalent Among Minorities from NPR. 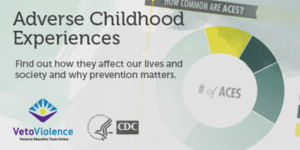 For a general overview about ACEs and how to prevent them, go to the Centers for Disease Control and Prevention’s About Adverse Childhood Experiences website. 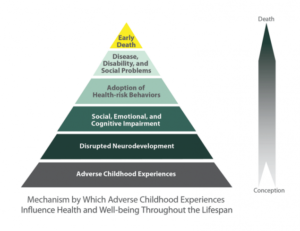 To see previous ACE studies, go to the Centers for Disease Control and Prevention’s Adverse Childhood Experiences Journal Articles website. To learn how to prevent ACEs and other forms of violence, download and read Connecting the Dots: An Overview of the Links Among Multiple Forms of Violence.